Lily takes scant comfort in meeting with her flirtatious best friend; by Lori Cramer. Lily hadn't heard from Cecelia in more than a week, so when the e-mail from cbauer@starrybrightindustries.com appeared in Lily's inbox between meetings, she clicked on it right away, even before the more-important work-related messages. "Sorry I've been so out of touch," the e-mail began, then went on to say that Cecelia had been "crazy busy" at work and felt "just awful" about "dropping the ball." The message concluded with a promise that if Lily arranged a time and place for the two of them to get together, Cecelia would make every effort to be there. Eager to connect with her best friend again, Lily picked up her phone and punched in the familiar number, but the call went straight to voice mail. At the prompt, she said, "Hey, Ceece. Got your note. Let's meet at Betty's Beanery tomorrow at noon. See you then." On the way to her next meeting, Lily flashed back to the fraternity party where she'd first encountered Cecelia. Even now, a decade later, she could still vividly recall how she'd felt both flabbergasted and fascinated by the way Cecelia had flirted with every guy in the room - including Lily's then-boyfriend, Miles. "Aw, she doesn't mean anything by it," Miles had reassured Lily at the time. "All she wants is a little attention." It turned out that Miles had been right - except that it wasn't a little attention Cecelia was after. She wanted every available ounce of it, 24-7. And she hadn't changed a bit since then. Being Cecelia's friend often felt more like being her personal assistant, but Lily had long ago made peace with that - along with the fact that voluptuous, vivacious Cecelia would forever be the center of attention while skinny, quiet Lily would never be more than a sidekick. Unlike Cecelia, Lily didn't mind if she didn't attract the interest of every man in the immediate vicinity. One at a time was plenty for Lily, and for the past seven months that man had been Hunter. Lily had almost finished her mocha latte by the time Cecelia breezed through the door at Betty's Beanery. Landing in the chair next to Lily's with a bounce, Cecelia brushed her silky black tresses out of her green eyes and grinned. "Hey, girl!" "I ordered you a double espresso." Lily pushed a cardboard cup across the table toward her friend. "But I'm pretty sure it's not hot anymore." "I know, I know: I'm late. But wait till you hear my excuse." Cecelia's glossy collagen-enhanced lips curved into a sly smile. "On my way out of the office, I ran into Bruce from marketing and he told me about this amazing ska band that's playing at The Dog House on Friday night." Lily raised an eyebrow. "Since when do you like ska?" "Like it?" Cecelia chortled. "I don't even know what it is. I'll tell you what I do like, though." "Mm-hmm! He's yummy." She licked her lips. "To you, Ceece, every guy's yummy." Cecelia took a sip of her beverage, then popped up out of her chair. "Where are you going? You just got here." "To have a word with that cutie at the register. He needs to get me a new espresso. This one's cold." "It'd be plenty warm if you'd have shown up on time," Lily muttered under her breath. Cecelia sauntered over to the register, which was manned by a gangly guy with a chin covered in peach fuzz. Despite the obvious age difference, Cecelia batted her eyelashes at him. He looked startled - but thrilled. Yet another guy turning to putty in Cecelia's expert hands. By the time Cecelia returned to the table, she had a coffee cup in each hand and a triumphant smile on her lips. She handed Lily one of the cups. "Freddy insisted we both have fresh ones. On the house, of course." Lily inhaled the sweet, chocolaty aroma of her latte and glanced back at the register, where "Freddy" was mooning over her friend as if she were a celebrity. 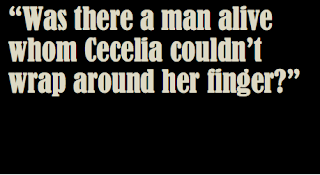 Was there a man alive whom Cecelia couldn't wrap around her finger? Cecelia's phone chirped. She unzipped her metallic purse, extracted a lime-green phone, and began texting. After a few minutes, she laid the phone down on the table. "Where were we?" "I was about to ask what you've been up to." "Oh, wow, where to begin?" Cecelia tapped her fuchsia-and-white-striped nails against the table. "This whole month's been one big blur. You know how my life is - busy, busy, busy." "Well, what did you do last weekend? I left you a bunch of messages, but you never called back." "This past weekend? Hmm, let me think." Cecelia tilted her face up toward the ceiling, as if she expected the answer to be written there. "Hard to remember. I was in and out. Running here, running there. I didn't check my messages." "How can you not listen to your messages? I check mine incessantly. Even when the only place I've gone is the bathroom." "Messages are old; I'm much more interested in what's fresh." Cecelia giggled. "Like Bruce from marketing." "Hunter's been acting weird lately," Lily blurted. Lily thought for a moment, searching for the right word. "Distant." "That's not exactly out of character for him, is it? Hasn't he always been one of those I-need-my-space kind of guys?" "I guess. But something about this feels different." "I'm not sure. But something's wrong, I know it." "You know? Or you suspect?" Lily bit her lip. "Well..."
"Come on, can't you cut the guy a little slack? I'll bet it's something stupid. You know how men are. Maybe he's bummed out because his favorite baseball team's on a losing streak. Something like that." "The Mariners are pretty awful this year. Hunter's always complaining about the bullpen coughing up the lead." "See? You're getting yourself all worked up for nothing." Lily forced a smile. "You think so?" "Of course." Cecelia sat up straight. "So now that I've solved your problem, Drama Queen, time to talk about me." "Why do I get the feeling you're about to mention Bruce from marketing?" "I need to decide what color to wear on my date. Red, right?" "He asked you out? To see that ska band?" "He hasn't said the actual words yet. But they're right on the tip of his tongue. I can tell. He's dying to take me out." "Man, I wish I had your confidence, Ceece." Cecelia flashed a luminous smile. "We can't all be me, now can we?" "Hey, whatever happened to that Shane guy - the one who invited you to that charity ball? Did you have fun with him?" "I thought you said he was the most interesting person you'd met in months." "Yes, you did. The day after the ball. Do you think you'll go out with him again?" Cecelia shrugged. "Depends on how bored I am when he asks." An attractive man with a salt-and-pepper goatee strolled past the table, then glanced back over his shoulder at Cecelia. She twirled a strand of hair around her index finger and gave him a seductive smile. "Do you know that guy?" Lily whispered after he was out of earshot. "I will in a minute." Cecelia got up from the table and made her way over to the sugar-and-cream station. Sure enough, Goatee Guy rushed right over to her. Lily tried in vain to avert her gaze as Cecelia reeled him in with a tilt of her head, a fluttering of her eyelashes, an "accidental" brush of her arm against his. A few minutes later, Cecelia returned to the table and tossed a business card down in front of Lily. "So what do you think of my new friend Gregg?" "Cute." Rubbing her diamond pendant between her fingers, Lily hoped she'd sounded more enthusiastic than she felt. Cecelia leaned forward. "Hey, where'd you get that?" "Oh, this? Hunter gave it to me on Saturday night." "That's not a real diamond, is it?" Cecelia squinted at it. "What kind of question is that? Of course it's real." "You don't have to get huffy." Cecelia leaned back in her chair with an air of self-righteousness. "It's not like it's a secret that Hunter's cheap." "He's not cheap. He just doesn't feel the need to prove his affection with expensive gifts." Lily touched the necklace again. "Usually." Cecelia folded her arms across her chest. "So what'd you do to get him to buy you diamonds?" "I didn't do anything. In fact, he's been so busy at work that we've barely seen each other the past few weeks. But then, out of the blue, he called and said he'd made reservations at Abe's Bistro." Lily smiled to herself. "We had a romantic dinner, and then, afterward, he gave me this necklace." Cecelia's eyes flashed. "Sounds like a guilt gift." "What would he have to feel guilty about? It's not his fault he's had to work so much." "Assuming he really was at work." "Where else would he be? Hunter would never - I mean, you don't think he'd -"
"How should I know? He's your boyfriend. But I'd make sure to keep my eyes open if I were you." Lily sucked in her breath. "Now that you mention it, I want to ask your opinion on something. Hunter smelled weird last time I saw him. Kind of... floral." Cecelia chuckled. "You think he's been wearing women's perfume?" "I think he's been cheating on me. With a woman who wears floral perfume." "Are you sure he wasn't just wearing some springy-smelling cologne?" "No, it was definitely a feminine scent. Like that flowery perfume you almost bought last month at Macy's." Cecelia's phone chirped again. She glanced at the screen, then stood up. "I've gotta go. They need me back at work." Lily got up too. "Before you leave, you have to tell me: Do you think Hunter's cheating on me?" "He'd have to be pretty heartless to cheat on someone as sweet as you." Cecelia patted Lily's shoulder. "Try not to worry. We'll talk later, okay?" She gave Lily a hug. Lily stepped away. "Ceece, you smell like -"
Cecelia held up her hand. "Don't freak out. It's not what you think." "Well, yeah, it is. But I was doing you a favor - putting him to the test to see if you could trust him. And, well, obviously, he failed. But aren't you glad you found out before you married him or something? Now that he's proven he's not good enough for you, you can cut him loose and find someone better." "Actually," Lily said, looking Cecelia in the eye, "what I need more than a new man is a new best friend. Hunter already confessed - told me how you'd persuaded him to meet you at your place, pretending you were planning some surprise party for me. The biggest mistake of his life, according to him." "Oh, is that what he said?" Cecelia's eyes blazed with fury. "So, you see, the necklace wasn't a guilt gift after all. It was an apology." "And you're going to take him back? After what he did?" Lily shook her head. "No. I'm finished with both of you. But I'm keeping the necklace." Very fun and clever story. I'm glad Lily got everything sorted out in the end. When Cecelia said "now that I've solved your problem, Drama Queen, time to talk about me." I chucked. That dialogue did a great job illustrating her character and personality. I also like the dialogue and the fact Cecelia got some degree of comeuppance in the end. But I don’t think she’s going to change. You're right about Cecelia! Thanks for the comment. Thank you so much, Belinda. Guess diamonds really are a girl's best friend.... At least they don't cheat and lie and do favours you can do without! She's well shot of both of them.